Although dinner is highly atmospheric and downright romantic in the warm, very pretty, alpine-styled and fireplace-warmed main dining room of La Clusaz, make sure you get there with daylight. This is because driving along the Strada del Gran San Bernardo, which takes you from Aosta into Switzerland (or viceversa) will have you looking at some of Italy’s prettiest mountain scenery. And the drive will be that more enjoyable with the knowledge that your final destination is one of Italy’s best alpine dining destinations. Documents dating back to 1140 also attest to La Clusaz being one of Italy’s oldest dining and watering holes, as travelers used to eat and rest there for the night prior to taking to the road again in the morning (and in fact La Clusaz is also a very charming hotel). Bought by Graziano Grange in 1925, La Clusaz is now run with flair and passion by Maurizio Grange and his family. I strongly suggest you listen to any recommendations that Maurizio has on the day you might stop by. In my opinion, he is one of the more passionate restauranteurs and hoteliers in all of Italy, dedicating himself to sourcing hard to get wines from little known producers as well as outstanding cheeses and other foodstuffs from local artisanal producers. A meal here is like taking a course in Valle d’Aosta Enogastronomy 101. 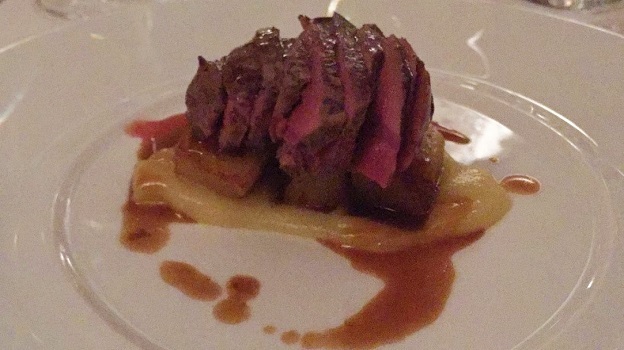 My most recent dinner at La Clusaz couldn’t have been any better. The seupa à la vapellenetse is a food staple of the Valle d’Aosta, a highly traditional and very hearty soup made with both white and dark bread, fontina cheese, Savoy cabbage and vegetable broth, although a majority of people I have talked to over the years also include a good dusting of cinnamon in their recipe. 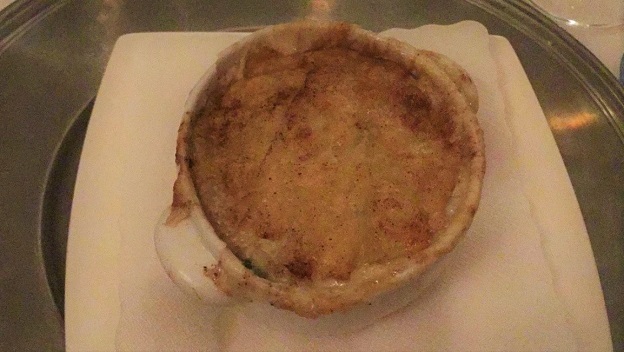 Vapellenetse is the local dialect for Valpelline, a town that is at the gateway of the eponymous valley, located at roughly 960 meters a.s.l and the birthplace of this specific soup. The version at La Clusaz is one of the two or three best renditions that I have come across in the region. 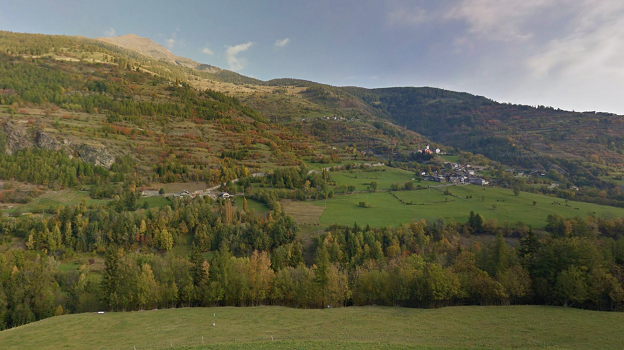 To put that statement in perspective, I have been going to the Valle d’Aosta two or more times a year for the last twenty-five years of my life; it’s my favorite region in Italy. Cheese fondue and polenta is another classic Valle d’Aosta recipe, and one I personally never tire of; my only complaint is that portions are never large enough! The rest of my dinner was a sequence of one precisely cooked, flavorful dish after another, with the delicate and airy herb gnocchi the best dish of the night. 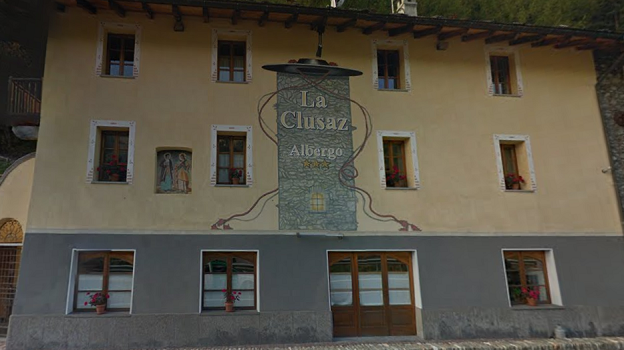 La Clusaz has a solid wine list, with many good choices from both Italy and France, but when I come here I always focus on the wines of the Valle d’Aosta, which, believe it or not, is also one my favorite wine destinations in Italy. Clearly, not many of these wines are available in the USA, but Vinous readers who visit or vacation in Italy might like to look for these wines while dining in Italian restaurants for a totally novel taste sensation. And though Valle d’Aosta wine production is a little under the radar outside of Italy, it’s the only place in Italy that makes Chardonnays that are actually drinkable. Its Pinot Gris (unlike the rest of Italy, the name used for both variety and wine is Pinot Gris, not Pinot Grigio, a testimony of Valle d’Aosta’s strong French roots) are the best in Italy, and there are a plethora of other outstanding wines made from little known but high quality native grapes. I started dinner with one of Italy’s absolutely best aperitif wines: the 2014 Piero Brunet Blanc de Morgex et La Salle, though nearly impossible to find unless you are in the area, is made from some of the valley’s very best vineyards of Prié Blanc. Back in the 1960s and 70s, it is these vines that the Abbé Bougeat farmed to make his extremely famous wine; it essentially made Blanc de Morgex et La Salle’s fame. Brunet’s version is riper than most, with bright mountain flower nuances complicating ripe apricot, pear and thyme aromas and flavors. 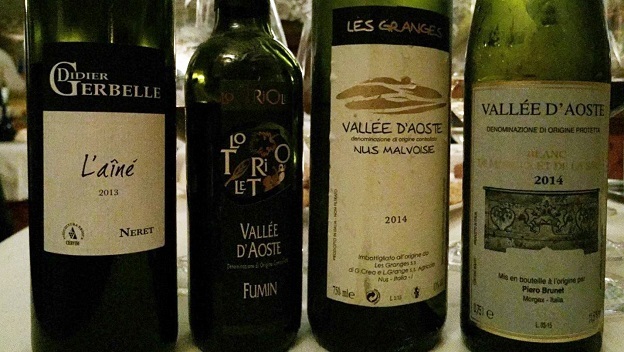 The 2014 Les Granges Nus Malvosie is almost as tasty: readers beware that Malvosie is the name used for Pinot Gris in and around the town of Nus, where it has had a long and distinguished history. This wine is brighter and fruitier than most (Nus Malvosie usually has a very savory and herbal quality to it). Next up is an absolute rarity, and the only monovariety Neyret (a distinct variety from all the other Neyret-something varieties found in Italy) wine available commercially in Italy. A very deep red, the 2013 Dider Gerbelle Neyret is a surprisingly tannic, brooding wine hinting at small dark berries and balsamic nuances that will require some cellaring prior to reveal all it has to offer. Last but not least, the 2012 Lo Triolet/Marco Martin Fumin only confirms that Marco Martin is one of Italy’s 20 or 30 most talented wine producers. This Fumin is a benchmark, loaded with herbal and licorice notes complementing small dark berry and black pepper aromas and flavors. Walking out the door after my comfortable and informative meal, it suddenly dawned on me I hadn’t been to La Clusaz for almost a year. Immediately resolved to never allow a similarly long time frame to elapse between visits.